Familia nuclearis Americana, in matre, patre, et liberis consistens, circa 1955. Ab anno 1970 ad annum 2000, dispositiones familiares in Civitatibus Foederatis diversiores factae sunt. 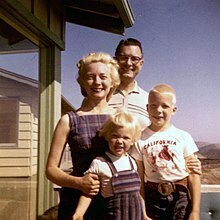 Familia nuclearis, sive familia elementaria vel coniugalis, est grex familiaris qui in binis parentibus et eorum liberis (uno aut pluribus) consistit. Distinguitur a familia parentis unius, familia extenta, ac familia plus quam binorum parentium. Familiae nucleares plerumque in coniugibus conduntur, sed multi liberi eis esse possunt. Sunt inter spectatores eruditos variae definitiones, quarum nonnullae solum liberos consanguineos, aliae vitricum aut novercam ullamque liberorum obnoxiorum compositionem sinunt, privignis liberisque adoptivis non exceptis. ↑ Haviland, Prins, et Walrath 2007: 219. Gordon, Michael, ed. 1972. The nuclear family in crisis: the search for an alternative. Novi Eboraci: Harper & Row. ISBN 0060424052. Haviland, Harald, E. L. Prins, et Dana Walrath. 2007. Cultural anthropology: the human challenge. Ed. 12a. Cengage Learning. ISBN 0-495-09561-3. Lehr, Valerie. 1999. Queer family values: debunking the myth of the nuclear family. Philadelphiae: Temple University Press. ISBN 1566396832 (textile). ISBN 1566396840 (charta). Thamm, Robert. 1975. Beyond marriage and the nuclear family. Franciscopoli: Canfield Press. ISBN 0063887266. Widmer, Eirc D., et Riitta Jallinoja, eds. 2008. Beyond the nuclear family: families in a configurational perspective. Novi Eboraci: Peter Lang. ISBN 9783039117048. Knight, Chris. "Early Human Kinship was Matrilineal." PDF. Novissima mutatio die 21 Octobris 2018 hora 21:32 facta.